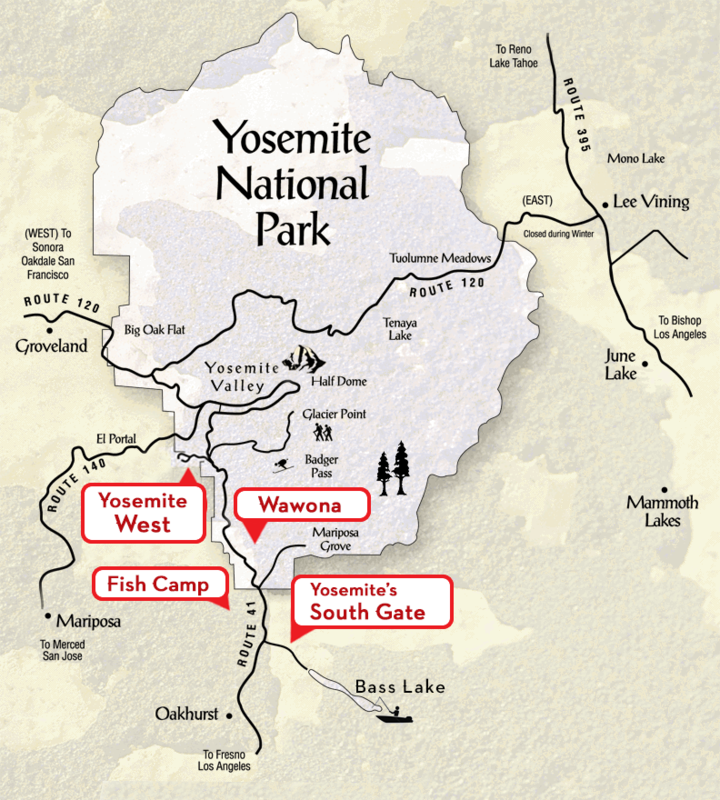 Yosemite’s Scenic Wonders is extremely close to wonders like Half Dome, Yosemite Falls and Mariposa Grove! Yosemite National Park, as seen on Ken Burn's KCET National Parks special, has no shortage of stunning vistas, cascading waterfalls, mountains galore and lush forests. Are you trying to decide which Yosemite sights to see? Ideally, you'd need a month or more to fully absorb all the Yosemite sightseeing the park has to offer; however, even in a short visit, you can take in the three major tourist highlights: Half Dome, Yosemite Falls and Mariposa Grove. Located in the park's valley, Half Dome is arguably Yosemite National Park's most famous landmark, and even appears on the California State quarter! Perched over the valley, the 4,737 feet granite crest was long considered inaccessible, but now offers an 8.5 mile trail to the summit, several rock climbing ascents and a cable system. From the top of Half Dome, visitors can enjoy the fruits of their labor by taking in Yosemite sightseeing of the valley below. Yosemite sights are plentiful, but one of the most magnificent has got to be Yosemite Falls. Made up of three distinct sections, each more impressive than the last, Yosemite Falls holds the title of being the highest measured waterfall in North America. Hiking trails are scattered throughout and around the falls, including some that take visitors near the hanging valley over which the falls first plunges into the valley. If you find yourself at the base of Lower Yosemite Falls (considered the prime spot for viewing the magnificent falls), beware the pool's "witches." Native folklore says that the witches don't like trespassers, and have sucked in wayward wanderers! Mariposa Grove Located only in the Sierra Nevada Mountains that fill Yosemite National Park, Giant Sequoias are one of Yosemite's greatest treasures. At the Mariposa Grove, conveniently located near Yosemite's south entrance, visit the Grizzly Giant, a leisurely 0.8 mile walk from the main parking lot. To wrap up your Yosemite sightseeing adventure, bask in the grandeur of these stunning trees and step in front of the Grizzly Giant to really get a feel for the immensity of a California redwood tree. With there being so much to do in Yosemite, it is truly worth your while to book an extended stay. If you are looking to lodge within the gates of Yosemite National Park, go ahead and give Yosemite's Scenic Wonders a call at 1-888-YOSEMITE (1-888-967-3648). We have numerous condominiums, cabins and homes for rent that are fully equipped with modern day conveniences. Simply call or make your reservation online today!